How to Turn BAD into GOOD Customer Experience using getWaiter! Giving customers the opportunity to leave INSTANT feedback increases the chance of fixing any customer experience issue before the perception chapter is closed. It is hard to put a smile on a customer that has already left your site with a sour taste in his mouth. You have potentially lost that customer forever; in fact you may have lost multiple customers as each of them carries a social cost. It is a tricky threat that takes a lot of effort to be turned into an opportunity for the business. Dissatisfied customers are much more likely to share their experiences on social media, and your business is guaranteed to find out last about them. Your brand image would have suffered a public review hit by this point and all you have left to do is being reactive. Customer care at this point rarely turns that customer’s perception around. The damage is normally bigger than the business can compensate for. Things do not have to go this way; you can quit walking on thin ice with your customer feedback and reviews management. It’s time to give your business a leading role of being proactive. Here at getWaiter! 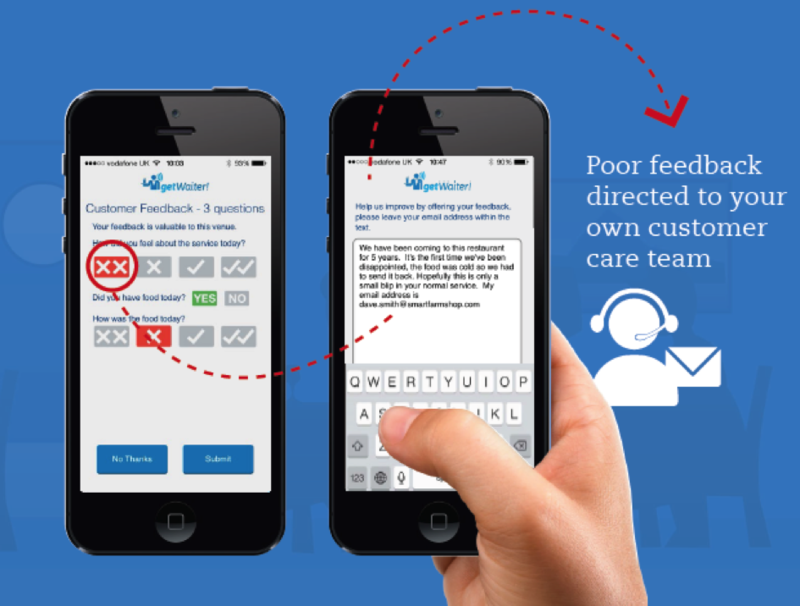 we understand the importance of giving our clients the competitive advantage with our instant customer feedback feature. This feature defeats the stereotypical feedback survey style that can take up to 20 minutes to complete and is a case of being accessed in the customer’s own time post their dining experience. The feedback can be left instantly on the getWaiter! app within seconds. The agility of the system allows for the default feedback questionnaire to be tailored to each businesses needs and objectives. The beauty of this feature is the instant access to the feedback collected. The management team receives data reports on a weekly basis. The live feedback collected is instantly visible on the waiter station app. (which is the waiter’s interface showing a queue listing of all customers that have called for their service). The feedback collected happens at a point of customer’s emotion. The ability to know and be able to rectify any issues with customer service at this point has the power to turn that customer’s perception around. That guest is much more receptive to your attempt of fixing their bad into good customer experience. You show care in immediate actions, and that is something that the customers will lean towards. It’s the small things that really matter. Customers can bicker about the smallest of things. If you know what they are and let the customers know you are going to deal with them ASAP they will feel valued and therefore more likely to become loyal. Your staff will become just a human in the customer’s eye. Having a conversation with your customers about the issues they have raised will help them to see you as just a human that has made a mistake and is willing to fix it. Showing compassion makes your customers not judge your business book “by the cover”. If the customer leaves feedback with you during their visit, they are far less likely to do it again separately on social media. This helps your business to have a better control over the reviews management and help to really understand your customers. It sends a strong message in action that your business is there to drive operational excellence. You are showing commitment to lead continous improvement. Nobody will deny a business that always tries to offer that little bit more to please it’s guests. The getWaiter! instant customer feedback feature also includes smart filtering. Contact us to find out more how we help to turn bad into a good customer experiences.